Well, Thanksgiving Day is almost here! Will our gratitude last beyond the afternoon nap? Is Thanksgiving—a one-time, get-it-out-of-the-way holiday that forces us to reflect on how blessed we are? Too quickly, people resort back to being ingrates and complaining about what they don’t have. 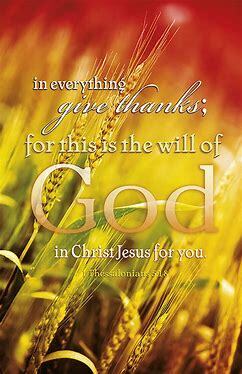 God’s will for us is to be thankful for all things. Believers, by faith, need to trust His design and sovereign will for them. “In every thing” carries an unlimited stipulation. It refers to everything that may take place in one’s life, except, of course, personal sin. No matter what struggles or trials God will directly or indirectly allow in our lives, there is always a reason for thanking Him. I Peter 1:6-9 tells us that we are to rejoice when we have been grieved by various trials. These trials test the genuineness of our faith which is more precious than gold and results in praise, glory, and honor to our Lord Jesus Christ. Even though we don’t see Him now, we do believe in Him and we will have a joy that is inexpressible because the outcome of our faith is the salvation of our souls. Gratitude should come naturally to believers for all that He has done for us. But, because of our hardness of heart, God encourages us to be thankful with commands that are essential and necessary. “Be careful (anxious) for nothing; but in every thing by prayer and supplication with thanksgiving let your requests be made known unto God” (Philippians 4:6). Joni Eareckson Tada, who was involved in an accident that left her paralyzed from the neck down, writes, “Giving thanks is not a matter of feeling thankful, it's a matter of obedience.” God wills our being thankful in all things because thankfulness is the ultimate expression of love. May you be filled with thankfulness for all Christ has done.